Militant Angeleno: THE MILITANT'S EPIC ANNOUNCEMENT! First off, HAPPY 237th BIRTHDAY, LOS ANGELES! The Militant Angeleno has attended all 26 CicLAvias since the event began in October, 2010. 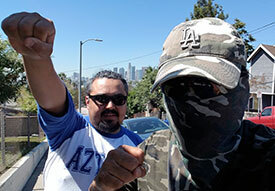 And since April, 2011, The Militant has published his Epic Militant CicLAvia Tour guides, detailing historic and unique points of interest in the various communities along each CicLAvia route. This time will be different*. The Militant, together with Ted Rogers from the bicycling advocacy blog Biking in LA are collaborating to bring you The Militant's Epic CicLAvia Tour - LIVE! A guided 8-mile bicycle tour (skateboards, scooters and rollerblades welcome too, though if you're on foot, you'd better know how to run fast!) through Grand Avenue, Wilshire Boulevard, Western Avenue, Melrose Avenue and Vine Street from Downtown Los Angeles to Hollywood. This will be an historic event as The Militant Angeleno will make his first formal public appearance! (Whoa, WUUUUUUUT?!?! NO WAY!) Way! He will be co-guiding the tour along with Ted Rogers. We will be meeting at 12 noon near the Grand Hub (near Walt Disney Concert Hall in Downtown. To register for the tour and get full tour information and details on exact meeting location, RSVP at militantangeleno [at] gmail [dot] com by Friday, September 28. The Militant and Ted look forward to meeting you on September 30! *The Militant will still be publishing his Epic Militant CicLAvia Tour XXVII guide in advance of this CicLAvia, but it will be a simplified version of the complete tour, which you'll get by joining us on September 30! 12 noon! why so late? Ciclavia starts at 9:00 no? Will we have enough time to finish the tour ?